Quentonian posted the fastest qualifying time for the $49,874 Louisiana Downs Maiden Stake to be contested Saturday at Louisiana Downs. BOSSIER CITY, LA—FEBRUARY 5 2019—The 2019 Quarter Horse racing season continues at Harrah's Louisiana Downs, with the final of the $49,874 Louisiana Downs Maiden Stake set for Saturday. Trials were run on January 19 for accredited Louisiana-bred 3,4 and 5-year-olds. Quentonian won the third of six 350-yard trials, setting the fastest qualifying time of :17.526 seconds. Owned by Gilbert Morales, the 3-year-old was bred by Kirby Bruchhaus breaking from the rail under rider Guadalupe Lucio, Jr. The gelded son of Sir Runaway Dash out of the Stawflyin Buds mare Tailor Dayne is trained by Josue Huitron, Quentonian came into his trial off three second-place finishes, but broke alertly and won by 2-¾ lengths. Huitron is off to an excellent start this season and reported that Quentonian came out of his trial race, in which he broke his maiden, in good order. He will reunite with Lucio as the 5-2 morning line choice. "He's an easy horse; never given us any problems," said Huitron. "I like our draw for the final; when he ran in trials for the (LQHBA Louisiana) Million, he broke from the two hole." Tdz Going Nuts, with Luciano Duenez in the saddle, won the final trial in :17.582 posting the second-fastest clocking of the afternoon. The gelded son of FDD Going Grand out of the Hadtobenuts mare Thequeenhasgonenuts is owned by Americo Ramirez and is trained by Rosendo Valdez, Jr. Claimed for $10,000 at Evangeline Downs, the sorrel gelding is in pursuit of his third consecutive win. "The reason we wanted him was because of his mama," said Valdez. "That side is important to me. He's doing awesome and we are happy with the job Luciano is doing. Since we started riding him, we've won a lot of races." Additional trial winners include Fast N Fun Jordan, who drew the rail for owner/ trainer Juan Diaz, Jr.; Ace Black Patriot, a son of Jet Black Patriot, who broke his maiden for owner Raul Penaloza Canada and Jose Barron's Swampi, who reunites with current Louisiana Downs leading rider Everardo Rodriguez. The Louisiana Downs Maiden Stake will run as the sixth race on Saturday with an approximate post time of 3:00 pm (Central). 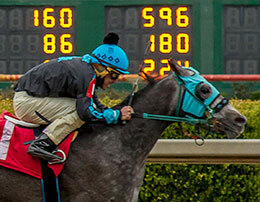 Harrah's Louisiana Downs will host eight schooling races this Friday, February 8 for 2-year-olds eligible for the Harrah's Entertainment Futurity. The individual heats at 220-yards, will get underway at 11:00 am (Central). Trials for the Harrah's Entertainment Futurity will take place on March 2 with the ten finalists returning on March 20. Harrah's Louisiana Downs is hosting an exciting on-track handicapping contest called the Road to Kentucky Handicapping Contest. It began on Saturday, January 19 with major stakes races and Kentucky Derby prep races featured each Saturday through May 4. Fans can register at the contest table adjacent to the program stand with weekly prizes awarded and points accumulated toward the $1,000 grand prize. For more information, For more information, CLICK HERE. The 2019 Quarter Horse racing season at Harrah's Louisiana Downs got underway on Saturday, January 5. The 46-day meet includes 12 stakes highlighted by the first official championship for 2-year-olds, the $100,000-added Mardi Gras Futurity on March 16. Live racing will take place Saturday, Sunday, Monday and Tuesday with a 1:00 p.m. (Central) post time and will continue through March 20. To see a complete list of the stakes schedule, including trial dates CLICK HERE.